Cambodia is a country with a variety of contradictions; rich and poor, young and old but also with a very flourishing history but also one with a deep mourning edge. Restrained but friendly people but also prostitution and the largest temples of the region. Jungle but also beautiful sandy beaches. The mighty Mekong river, a large lake but also mountains. Still corruption while two senior Khmer leaders in prison are still serving life imprisonment. Once leader of the great Khmer empire, also wedged between superpowers Thailand and Vietnam and once almost wiped off the map. Tourism is a great asset in Cambodia but still a visit to this country is an adventurous experience. Welcome to Cambodia. 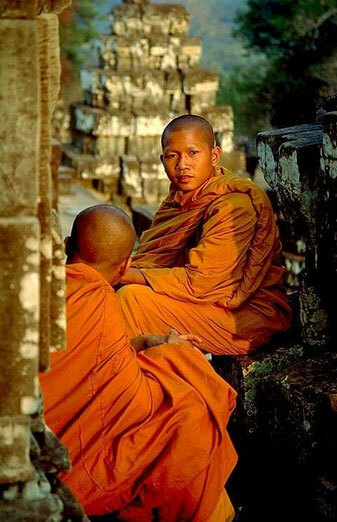 Cambodia was once the heart of the powerful “Khmer” empire that also embraced Vietnam, Laos and Thailand. Angkor Wat, the old capital spread over hundreds of kilometers with as many temples. The centuries after that, Cambodia would slowly be undressed by neighboring countries Thailand and Vietnam. Colonized by France, the country was occupied by Japan during WWII. Independence was proclaimed but the old colonizer already took over the country again. The civil war, at the end of the last century, was the real black page of the country - a quarter of the population was exterminated by the guerrilla fighters of the communist Khmer. Ironically, it became quiet again when neighboring Vietnam occupied Cambodia, even though the Khmer Rouge fighters would occupy parts of the country until the mid-1990s. Current problems include the influx of Vietnamese and the influence of Thailand. AIDS also plays an important role since the Khmer man pertinently refuses the condom. Prostitution is widespread and widely accepted. Even on the political level, it remains unsettled in Cambodia. The great political rivalry between the parties of Hun Sen, Prince Norodom Ranariddh (supported by King Norodom Sihanouk) and Sam Rainsy in combination with the abundant availability of war gear are a threat to the stability of the country. There is also a lot of corruption. The harrowing poverty resulting from all this, together with the countless land mines and their consequences, are a major problem in rural areas. 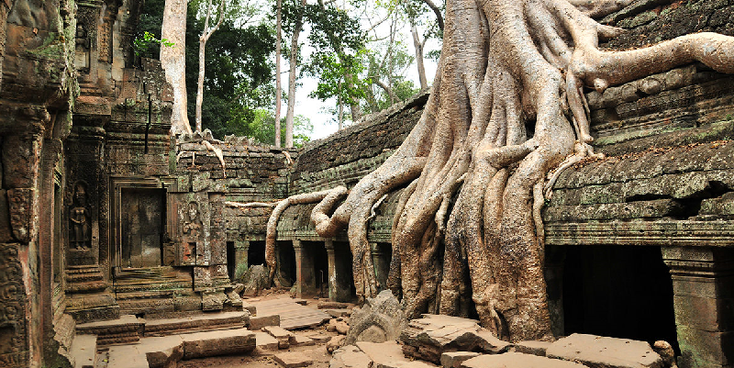 Despite all the problems, Cambodia is and remains a beautifully diverse travel country. Angkor Wat is the main attraction in the country but it has so much more to offer. So you can view beautiful colonial architecture in the city of Battambang, make a multi-day trip in the jungle of "Ratanakiri" for example to spot the "Ho Chi Minh Trail" or the many different mountain tribes that offer their merchandise at local markets. A trip on the Mekong river or just an afternoon of sandy beach in the port city "Sihanouk" is a “must”. A visit to Cambodia also includes an honorable visit to the "Killing Fields" and/or to the slaughterhouse "Tuol Sleng" which served as a prison during the Khmer Rouge years. Villages on the water can be viewed on the large "Tonle Sap" lake or you can take a boat trip on the river to discover the almost extinct "Irrawaddy" dolphins. Mountains, rivers, plantations, rice fields but also a trip on the bamboo train are all things that you can and must see and do when you come to Cambodia.